A man suspected in the killing of a Southwest Washington sheriff’s deputy is dead after an encounter with law-enforcement officers Sunday evening. The suspect was identified by the Cowlitz County Coroner’s Office on Monday as Brian Dellaann Butts, 33, of Longview. The Cowlitz County Sheriff’s Office told KGW he was the primary suspect in the killing of Deputy Justin DeRosier, 29. Two other men are in custody, the sheriff’s office told KGW. The Cowlitz County Sheriff’s Office said the Sunday evening shooting of Butts happened in the area of Spencer Creek Road in Kalama. No officers were hurt. DeRosier died after he was shot Saturday night while responding to a call. DeRosier was shot around 10:11 p.m. after he was sent to investigate a disabled vehicle blocking Fallert Road northeast of Kalama, the news release said. He was shot shortly after arriving on the scene, the Sheriff’s Office said. The deputy died from his injuries shortly after he arrived at PeaceHealth Southwest Medical Center in Vancouver, according to a news release from the Cowlitz County Sheriff’s Office. The shooting is believed to be the first in-line-of-duty death in the Cowlitz County Sheriff’s Office’s history, which stretches back to the middle of the 19th century, Sheriff Brad Thurman told The (Longview) Daily News. “It is devastating for all of us,” Thurman said. All sheriff’s personnel were sent home, except for those investigating the shooting, and other law enforcement agencies are covering the county, The Daily News reported. DeRosier is survived by a wife and a 5-month-old daughter, according to the Sheriff’s Office. DeRosier joined the Whitman County Sheriff’s Office in 2013 before becoming a deputy in Cowlitz County in 2016, The Daily News reported. He was a 2012 graduate of Washington State University. 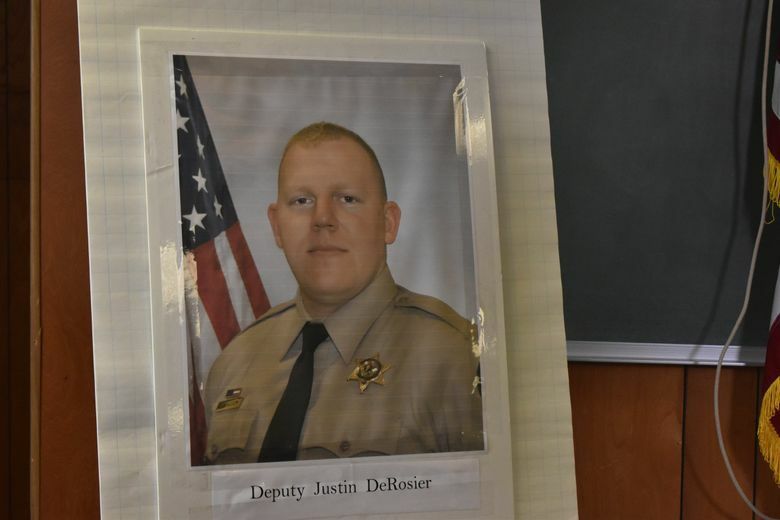 The shooting of DeRosier comes less than a month after a Kittitas County sheriff’s deputy was shot and killed and a Kittitas city police officer was wounded in a shootout March 19 with an armed man. The suspect was also fatally shot. Information from The Oregonian is included in this report.